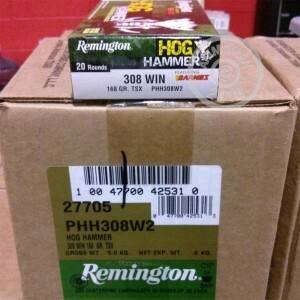 If wild boars are your quarry, then you should try Remington Hog Hammer ammo. These .308 Winchester cartridges fire a 168 grain solid copper Barnes Triple Shock (TSX) hollow point bullet at about 2,750 feet per second, delivering tremendous expansion and penetration without heavy fragmentation or lead contamination. This ammunition is manufactured in Lonoke, Arkansas and comes in boxes of 20. Like other Remington ammo, it uses non-corrosive Boxer primers. Special features of this load include durable nickel-plated brass cases and low-flash propellant ideal for dawn or dusk shooting. Stock up on .308 ammo (and most other calibers) at AmmoMan.com and save by buying in bulk! With free shipping for all orders over $99, it's easy to keep track of your costs and take advantage of double-digit savings.